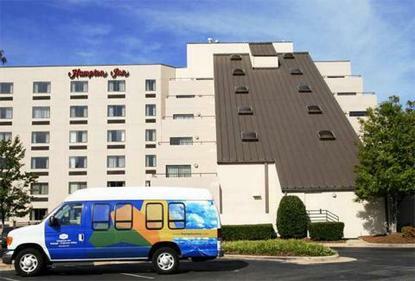 Hampton Inn Raleigh-Crabtree is conveniently located in northwest Raleigh only 15 minutes from RDU International Airport and Research Triangle Park and 10 minutes from downtown Raleigh. Access to the hotel is easy via I-85, I-40, I-440, and I-540 I-95 is only 40 minutes to the east. There are over 30 restaurants featuring a variety of cuisines and abundant shopping within a three mile radius. We feature 6 floors with 141 rooms, 10 of which are whirlpool suites with balconies, wet bars, refrigerators, and microwaves. All rooms include hairdryers, coffee makers, irons/boards, voice mail, and data ports. Amenities include a deluxe complimentary continental breakfast, manager's reception (Monday-Thursday), and TV with cable. We also offer outdoor pool, sauna, excercise room, connecting rooms, and cribs. Laundry/valet services, meeting/banquet facilities, audio visual equipment and rollaway beds are available for a nominal fee.